It means that the computer can't find a valid system folder to start from. To help you we need to know: What Mac is it and did you get any software CDs when you got the computer. If it's any help, this more than likely isn't a major problem. I have a book and its called setting up your studio display 17 inch CRT it's an apple. but it dosent really help me with much. so i really dont know what to do to get it going at least to be able to see the desktop. He got a floppy with it but it woudnt load at all its weird.. thank you. Somewhere on your Mac is a nameplate or a number (usually on the front). Can't help you without knowing what Mac it is. The problem is not with the monitor. The problem is with the Mac. What kind of Macintosh is it? It's also quite possible that someone has been playing with the "StartUp Disk" control panel and has switched the startup volume to a device that has no valid system folder or to netboot. I had a similar problem with an iMac. The machine was setup to do a boot from a systemless volume. How long did you leave your Mac powered on for? If your Mac has more than one volume (hard drive, etc. ), just leave your Mac powered on and it will eventually find your System folder. It could take a few minutes but it will find the system folder. This is assuming that your System folder has not been altered, corrupted or erased. If you have a System folder that has been corrupted, you will need to boot from another volume and reinstall your system software. If you have a floppy drive in your Mac, you can boot your machine with the System 7.5 Network Access disk and do a network install on your Macintosh. The easiest way however, is to use the Install CD that came with your Mac. It's also possible that the drivers on your hard drive have become damaged and that the Mac is unable to boot your hard drive. If this is the case, you will need either a disk utilities floppy disk or a bootable system install cd. Depending on the method you use, you can either run the disk first aid utilities or do a reinstall of your system folder. Both methods will fix a corrupted disk driver. Finally, it is possible that your hard drive has just plain ol' died. If this is the case, you will need a new hard drive and you will need to install system softawre and whatever other software you intend to use on your new hard drive. I think that they were messing with it and that could be the issue. but i will go over today and look at it again and see if i can see what kind of computer it is and all that other stuff, and than i will reply to you guys, thank you all for you comments and i will try and reply later on today. ... so take a paperclip and straighten one end. You will see a lil tiny hole near the lower right of the floppy drive. Stick your Disc Removal Tool in that hole and push... the floppy should be forced out, and you might be able to boot. Bingo! If you have a floppy disk stuck in your floppy drive, that is most definitely your problem. The Mac will always attempt to boot from the floppy drive before it checks the hard drive or the CDROM. The floppy drive has top priority. Your Mac will check to see if there's a floppy disk inserted into the drive. If there is a disk inserted, the Mac will look to see if there is a valid System Folder on the floppy. If there is a valid System folder on the floppy, the Mac will boot from the floppy. If there is no valid System Folder on the floppy, the Mac will eject the disk and move on to the Hard Drive. The flashing icon that you get in the middle of your screen would most definitely indicate that there is no valid system folder on your startup volume. In this case, your startup volume is a floppy disk. The Mac will then attempt to eject the floppy disk and boot from another volume. Unfortunately, if the floppy becomes lodged in the drive, the Mac thinks that another floppy has been inserted and will continue to search the floppy drive for a valid System Folder. The Mac will not "move on" to another boot volume until the floppy disk is either removed from the drive or the drive is physically disconnected from the Macintosh. well the floppy had been in the drive for like a whole day, so you could hear a noise like if it was trying to eject the floppy and it coudn't. im not sure why, but i was on for awhile and than i turned it off and pulled the floppy out with a needle nose, so than i turned the computer on and the folder was still in the middle of the screen so I'm really not sure on what to do next. thank you all. We still need to know which computer it is since you *may* have to open it up. If -- and I say IF -- the removal of the floppy with a needle-nosed pliers damamged the floppy drive. A damaged floppy drive will impede the computer from starting up. Is there a CD drive? Please tell us which Mac it is. It would be much easier to help. The Mac sounds like a tower PowerMac G3 or G4. Whichever it is, it is unlikely that you have an internal floppy drive (you might have an LS120, but those wern't common in the PowerMacs). Is the Mac's casing Blue and White or Grey and White? What makes you think that it's a new world PPC Mac? I've looked at the icon in the image that was offered and could not determine which generation Mac the machine is. Although, the icon does indicate that it is a PowerMac. The 17" display might have suggested that it was a fairly recent iMac, however the letters "CRT" would suggest otherwise. The floppy drive information is a little more telling. An external floppy drive would be very easy to disconnect from the machine; all Macs that lack internal drives use USB ports to connect external devices. So, the icon doesn't tell us anything except that the machine is a PowerMac and not a 68k machine. The 17" CRT tells us that the machine is not a recent iMac, iBook, or PowerBook. The floppy dilemma strongly indicates that it's a PowerMac of "internal floppy" vintage. Of course, this is all based on the assumption that the person who had started the thread, knows the difference between an LCD screen and a Cathode Ray Tube, and understands that it is much easier to disconnect a USB connected external floppy drive than it is to yank a lodged floppy disk from a drive with needle-nose pliers. My guess is that we're dealing with either a 603, 604, or early G3 class machine. Something of the beige variety. That question mark icon for "I can't find the system folder" was introduced on the new world Core99 macs. The first being the iMac and th 101 powerbook (that everybody mistakenly calls Lombard). No machines of this era were equipped with an internal floppy drive. Maybe a ZIP perhaps? Hold down the following keys when you start up. Command (the one with the funky cloverleaf on it), Option, O, and F. After you are holding those keys down, turn the machine on and wait for a white text console to appear. Type: set-defaults and hit enter. Next type: boot hd:\\:tbxi followed by the enter key and if the hard drive contains valid system software, the machine should boot up. My mistake... My apologies to aladds. How stupid of me... New World ROM, of course. That icon was introduced in 1998 with the iMac. So, it's possible that somebody jammed a floppy disk into the Zip drive slot, and the floppy had to be removed with needle-nose pliers... Ah, it's getting quite clear. YUP I got to give it to all of you guyssss ARE so SMARTTTTTTTT!!! you guys figured it out. 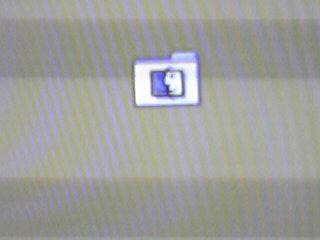 thats the computer that my inlaws have, looks just like that one, and thats the same lil folder that i was talking about two face and the question mark, grey and white. sorry i wasnt much help with the information, but you guys are so smart that you guys didnt need me to tell you guys what kind it was either way. I know nothing about computers as if it wasn't so obvious lol. All i know is what i have learn from the problems that i have came acroos with my dell laptop, and belive me its been ALOTTTTTT!!! i will repost when i go and try what DR. BOB said THANK YOU GUYS SO MUCHHHH!!! The command key has a cloverleaf pattern or an apple outline on it. It's to the right of the option key and the left of the space bar. oh ok i did press that key and the o and f but no luck......? so i really dont know what to do. so i tried what dr.bob said but no luck. so now i really don't know what to do? if anyone has any idea feel free.. thank you very much. Boot up the computer while holding down the option key. Then click on one of the buttons with the Mac OS 10 "X" on it. Then reboot.